NVIDIA Inspector is a tool created by Orbmu2k. It provides detailed hardware information, much like GPU-Z, from the hardware senors on the video card. This sensor information can also be monitored via the included "monitors", which in turn can be logged to a CSV file for later viewing. Inspector also provides simple overclocking tools to control the GPU clock, memory clock, shader clock, voltage, and fan speed of the video card; however, not all of these options will be available to all users. The availability of these tools is dependent upon the video card. NVIDIA Inspector's real gem lies within its driver profile settings (game profiles). Inspector includes over two hundred individual game profiles. Profiles allow user-defined, game-specific Inspector presets that will be loaded and used when the game is launched. The settings available here are more extensive than the settings included in the NVIDIA Control Panel. This allows for better control and finer tweaking ability. Finally, this guide does not provide the "gold-standard" of Inspector settings which users simply copy. That would be impossible to do with the endless combinations of video cards and system hardware available. This guide simply provides a breakdown of each of the Inspector dialog menus so users may be better informed about the capabilities of these settings and the applicability to a particular game environment. However, some recommended settings for Skyrim users are mentioned since this guide was created with Skyrim in mind. When you open the Inspector, this is the first window that appears. This window contains all the hardware information about the graphics card. There are two buttons on the upper left side. The first button uploads a screenshot of the app to Techpowerup.org. The second button below that will open the hardware monitors. Further down and to the right of the Driver Version box is a button which opens the game profiles plugin for Inspector. Finally, at the bottom there is a banner to allow donations, a drop-down box to allow switching between multiple GPUs, and a button that will open the Overclocking pane. Clicking the [Show Overclocking] button will prompt a warning about overclocking, before the pane opens. Clicking the [Sensor Monitoring] button will open this screen. Monitors are discussed in the Sensor Monitoring section below. Clicking the [Driver Profile Settings] (game profiles) button will open this screen. Game profiles are discussed in the Custom Profiles and Settings section below. Clicking on the [Show Overclocking] button and choosing "Yes" to the prompt will open this overclocking pane. Overclocking is discussed in the Overclocking section below. Of these, the most useful are going to be determined by what task the monitors are being used for. To open the monitors, click on the [Sensor Monitoring] button located on the main screen on the upper left side. Once opened, the monitors are defaulted to stay on top of all other windows. The default monitors displayed are the GPU Usage, GPU Clock, Voltage, GPU Temperature and the Fan Level. To change the monitors simply right-click on the monitor window and hover over [Monitors]. The monitors which have a check beside them will be the monitors displayed. Users may display as few as one or all of them. 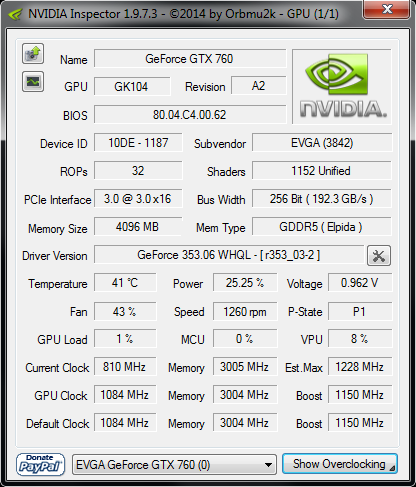 This allows to users to select which GPU they wish to monitor. Multiple GPUs will be for users running SLI, a second video card as a physics processor, the on-board GPU, etc. Provides a list of all the monitors available. Makes the graphs a bit less jagged. Toggle whether the monitor windows stays on top of other windows or not. Toggles whether to capture all monitor data or just the monitors displayed via the Monitors menu. Enabled by default. Toggles whether or not to log the active monitors to a CSV file for later viewing of the data. Selecting this will save the active monitors for the next time Inspector is opened; else, the default set of monitors will appear when Inspected is closed and reopened. Resets the monitors to start fresh. Minimizes the monitor window to the system tray. This is useful when monitoring your system over time. Notice: Users may see a difference in some of the available settings from what is seen in the images below. Various options are available with various Nvidia cards so do not be alarmed if there are extra or missing settings from what is seen below. Driver Profile Settings or "game profiles" can be opened from the main screen by click the [Driver Profile Settings] button located to the right of the Driver Version box. Game profiles are the main attraction with NVIDIA Inspector because when used, these profiles will allow custom driver settings for individual games. The profiles will then be saved and loaded once the game is launched. What's the difference between the NVIDIA Control Panel profiles and NVIDIA Inspector profiles? Inspector provides a more extensive set of settings and options than the NVIDIA Control Panel does. Many of the settings and additional options that are included in Inspector are hidden from the Control Panel, but still exist within the driver. Inspector gives users full control over these hidden settings. Over 200 profiles are already included in Inspector and there is rarely a need to create a new profile. This is because the profiles exist within the graphics drivers, themselves. 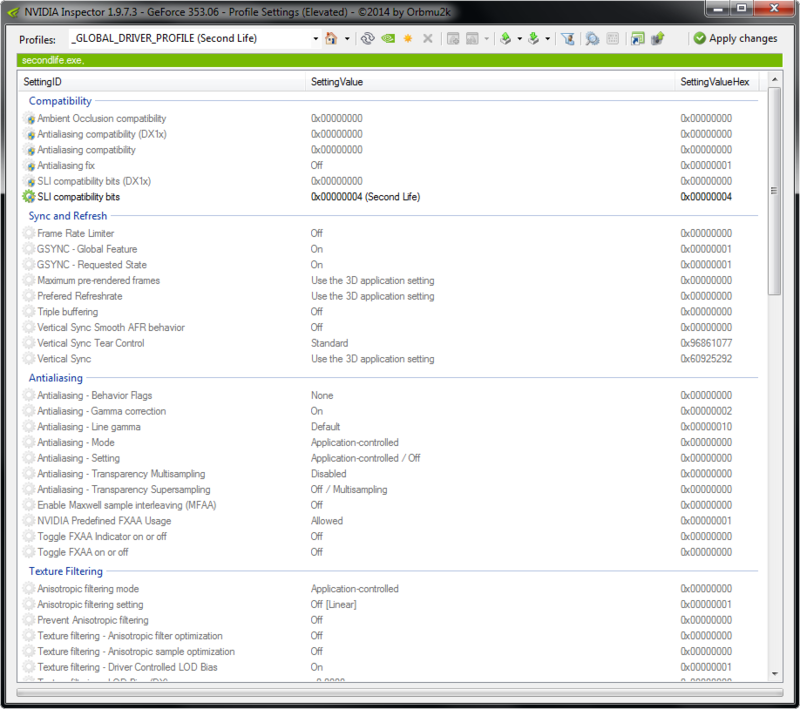 Whenever NVIDIA releases a new driver version, they often come with new or updated profiles. Skyrim's profile is one of these; however, if you ever need to create a new profile you can do so by clicking the [Create New Profile] button on the toolbar of the Driver Profile Settings window. Notice: The following procedure is for the Skyrim profile in regards to STEP; however, the procedure is the same for editing the settings for all game profiles. To load Skyrim's profile, open the Driver Profile Settings window. In the text box on the toolbar, type Elder. There will be four profiles for the Elder Scrolls games. Click on the profile for "Elder Scrolls V: Skyrim". This loads the pre-configured profile for Skyrim. If users have already set some settings in the NVIDIA Control Panel, those settings will be seen here. If not, the settings will be at their defaults. We'll go through each section and settings below which are relevant to the STEP Guide. Far more detail about each section and setting can be found in the Advanced Settings section below. These settings should generally not be changed since they are set to work with Skyrim by default. These settings should generally remain at their defaults as shown in the image above. The settings for AA should match the picture above for the STEP recommendations from the STEP Guide. The STEP Guide mentions the two settings listed below. To further tweak this section refer to the Advanced Setting section further down in this guide. Mode should be set to "Application-controlled". The default AA method in Skyrim is Multisampling (MSAA), so "Application-controlled" yields MSAA. This should also be set to "Application-controlled / Off" to ensure that AA is working. The settings for AF should match the picture above for the STEP recommendations from the STEP Guide. In the INI tweak section on the STEP Guide, Anisotropic Filtering (AF) was turned off. Now it needs to be turned on using Inspector. This should be set to User-defined / Off. Recommended value is 16x; however, a very slight performance gain can be achieved with a lower setting. It is not recommended to drop below 8x. Setting this to a high value like 16x as recommended, may cause texture shimmering in mid to long range texture LODs. If this happens, adjusting the LOD bias value can help to remedy the issue. To learn how to do this, visit the Advanced Settings section below. Notice: STEP GUIDE USERS STOP HERE! At this point, users should be done with any editing needed for the STEP Guide. For users who are installing the STEP Guide, please return to it and finish setting it up before doing any advanced tweaking in Inspector. User's STEP setup should be 100% stable before moving on to the advanced section of this guide below. There are many settings for NVIDIA GPUs and more are being added with every generation of GPUs, so this section will explain many extra settings that may be of interest to users that want to further customize their experience. Notice:STEP users should not complete this section until their STEP installation is complete and confirmed to be stable. Warning: Inspector nor STEP can be held liable for any possible mishaps resulting from overclocking video cards. Potential problems resulting from overclocking can include anything from voiding warranties to overheating, bricking (rendering it useless) the video card, and anything in between. If users decide to overclock their video card, they do so at their own risk. This overclocking overview is meant for information purposes only and is not an overclocking guide! 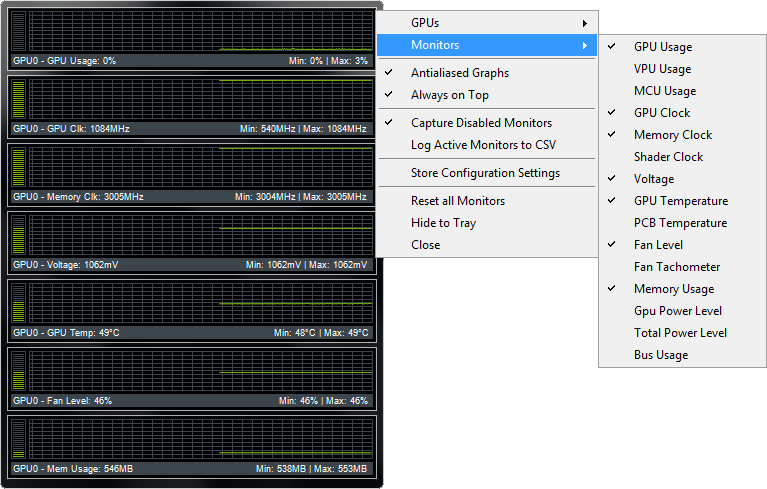 Overclocking in Inspector is not much different than overclocking in other third party software. 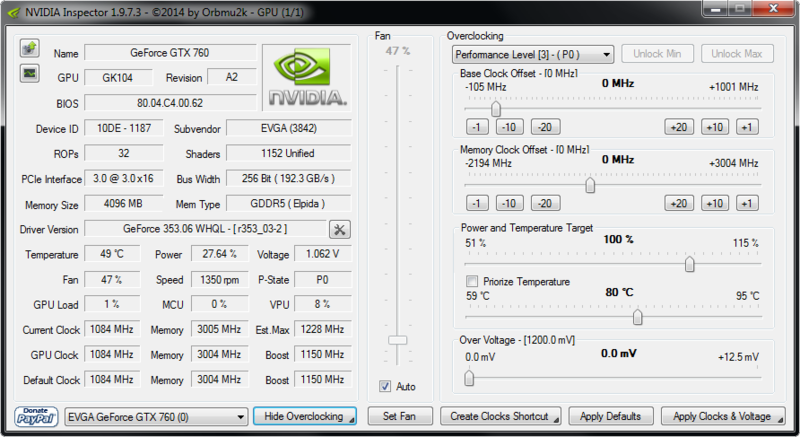 Keep in mind, depending on the video card model, not all overclocking controls will be at available in Inspector. Inspector was not written with overclocking in mind; therefore, if a more powerful and precise option is needed, users should look elsewhere. It's also a good idea to have monitors open when overclocking to monitor the effect of the changes. To open the Overclocking pane, click the [Show Overclocking] button at the bottom of the main screen. A prompt with a warning will appear asking if users are aware of the risk with overclocking. Clicking [No] closes the windows. Clicking [Yes] will open the overclocking pane. Clicking the [Show Overclocking] button again will hide the pane. The large vertical slider controls the fan speed on the video card. By default it is set to [Auto] and that is the recommended setting. Changing this could overwrite other third party fan control solutions. To manually set the fan speed, uncheck [Auto] and move the slider to the desired position. Then click the [Set Fan] button below the slider to lock in the new setting. Warning:Be aware! Setting the fan speed too low can cause overheating when the video card is working harder than the fan's ability to cool it. This is a drop-down menu which allows the selection of various performance levels the NVIDIA drivers use. The performance level is normally changed dynamically by the drivers depending on the GPU load. The main levels are P0, P1, P8, and P12; though this may differ depending on the card model. P0 is for high loads such as video gaming, P8 is for loads similar to video acceleration, and P12 is an idle load; when the video card isn't really doing anything. If there are different values, remember that the lower values are higher performance and the higher values are for lower performance. The frequencies available by default are locked in via the NVIDIA drivers. Clicking "Unlock Min" or "Unlock Max" will removed these driver limitations so overclocking to higher frequencies or underclocking to lower frequencies is enabled. Clicking these buttons again will re-lock the frequencies to the driver limitations. The GPU clock normally stays grayed out and is provided for informational purposes. This clock can be changed but not individually with Inspector. It is changed by changing the Shader Clock and always remains half the frequency of the Shader Clock. For example, if your Shader Clock is set to 1600MHz then your GPU Clock will be set to 800MHz. Measured in megahertz, this changes the frequency of the GPU clock. The buttons below the sliders allows for fine tuning of the frequency. Measured in megahertz, this changes the frequency of the card's VRAM. The buttons below the sliders allows for fine tuning of the frequency. Also measured in megahertz, like the Memory Clock Offset, this changes the frequency of the Shader Clock. These two sliders set the power target and temperate target for the video card. The top slider sets the upper power target which is the power the card will use. The second slider sets the temperature upper target which is the maximum temperature the card will run at. Checking the [Priorize Temperature] box will set the temperature target to take priority over the power target. This is a safety feature to help prevent the video card from overheating. If these settings are used, it is highly recommended to check the [Priorize Temperature] box. Warning:Be aware! Setting either of these sliders too high could cause the video card to overheat. Here it is possible to change the voltage to which the video card receives. This is one of the positive features of Inspector! Clicking the [Create Clocks Shortcut] button will save a shortcut to the desktop with specific, preset clock settings. This means it's possible to have different overclocks for different game profiles or other tasks. Double clicking on one of these shortcuts will adjust the clocks to the preset settings automatically. This eliminates the need to open Inspector to change settings for each game or use. So if a 10% overclock is desired while video encoding, a 25% overclock while gaming, and default settings the rest of the time, all that is required is to make three Clock Shortcuts with the respected settings and double-click the appropriate shortcut anytime to change between presets. One of these preset can also be loaded at system start-up by simply placing the shortcut in the "Startup" folder in the Windows. This reverts any changes back to their driver defaults. This applies the clock and voltage settings immediately. The default Skyrim profile can be adjusted or a custom profile, which has already been discussed, can be used to further tweak the game. Most of the settings and their functions will be listed here; however, do not be alarmed if the profile looks different from the images below. Various graphic cards will have various options available to them so users may see more or less settings than what is covered below. Notice: The following sections are specifically for Skyrim. They may be used as a reference to understand what the settings functions are; however, the recommendations given are specifically for Skyrim. They may or may not apply to other games. This section determines the compatibility for other sections in the profile. Rarely do these settings ever need to be changed from their defaults. For Skyrim, these settings should not be changed as they are set to be compatible with the game. This changes how ambient occlusion (AO) is processed and works in the game. This changes how antialiasing (AA) for DirectX 10 and higher is processed and works in the game. This changes how antialiasing (AA) for DirectX 9 and lower is processed and works in the game. This changes how SLI for DirectX 10 and higher is processed and works in the game. This changes how SLI for DirectX 9 and lower is processed and works in the game. This section covers everything related to video frames displayed on the monitor that is controllable within the video drivers. This is the driver side frame rate limiter. Capping or limiting the frame rate is useful for users with high-end cards or users with 120/144Hz monitors, since it is typical the frame rate will frequently move between above and below the monitor's refresh rate. This up and down causes choppy graphics and running above 60FPS will cause havoc issues in Skyrim. Limiting the frame rate prevents this. Users who need to limit their frame rate should set the limit to 58FPS for Skyrim. A more general recommendation is to cap the frame rate to 2/3 of the monitor's refresh rates which is measured in hertz. For example, a user with a 120Hz monitor should cap their frame rate to 80FPS. User should be aware that ENBSeries also includes a Frame Rate Limiter which can be used instead of this driver version. Notice:Pay special attention to triple buffering and v-sync below if using FPS limits on high-end cards. Notice:Monitor refresh rates of 75 Hz may be fine without FPS limiting, but 60 Hz is a typical refresh rate. Turns on NVIDIA's GSYNC feature for users who have a GSYNC enabled monitor. Maximum pre-rendered frames sets the number of frames the CPU can pre-render before the GPU takes over. Increasing this setting can cause an input delay (in milliseconds) from the mouse and keyboard when set to higher values; however, this will be different for every user. Raising this value can actually improve performance if users experience no input lag or stuttering by doing so. If experimenting with this setting, no harm will come from doing so. when changing the value, use the highest value possible where no lag or stuttering is experienced. When vsync is enabled, triple buffering improves performance between the frame rate and monitor refresh rate, when the frame rate is less than the monitor refresh rate. When it is not, there is still no drawback from using this feature. This setting does nothing when vsync is disabled. Notice:Pay special attention to Frame rate limiter (above) and Vertical Sync (below) when using limiting FPS on high-end cards. This supposedly smooths out the stutter from movement and panning when vsync is enabled. This has not been tested well for Skyrim, though. Some users report smoother camera panning with this setting turned on so users experiencing some stuttering when moving the camera from side to side may want to enable this to test if it helps reduce the issue. Recommended setting is to leave this set to [Off] until more testing is done. This controls the type of vsync used for the game. Leaving this set to the default option is best in most cases. Users should leave this setting on [Use the 3D application setting] in most circumstances, unless playing an older game which does not have native vsync. In that case, users should use the, [Force On] option. For Skyrim users: If iPresentInterval has been set to 0, users should change it to 1 or simply delete the parameter from the INI to force the default, which is enabled. iPresentInterval should NOT be disabled in the Skyrim.ini file! If users are using an ENB Preset or ENBoost, then vsync should be enabled in the "enblocal.ini" file. Notice:Pay special attention to Frame rate limiter and Tripple buffering (above) if using FPS limits on high-end cards. This section deals with everything antialiasing which is controllable withing the drivers. Notice: Any ENBSeries version after v0.119 no longer has support for hardware AA. Users planing on using an ENB Preset which requires a version newer than v0.119 will need to disable AA in the drivers. ENBSeries v0.139 and above offers edge antialiasing which is similar to MSAA, but with a bit more blur. ENB Preset users looking for a better AA solution should use SMAA Injector. This does not apply to users only using ENBoost. This tells the driver how to use antialiasing. Users would not normally change this from the default. The default setting is On. Gamma correction can improve colors in a game in come circumstances. This setting tells the drivers how to process AA. The [Application-controlled] value allows the game to control the AA is processed. The [Override any application setting] option will override the game's AA and force the AA method which is specified below in Antialiasing - Setting. The [Enhance the application setting] will process the AA method specified below in Antialiasing - Setting in addition to the game's default AA. This last method can be performance intensive since two AA passes are performed before the frame is displayed on the monitor. SMAA users will want to set this to [Application-controlled]. This setting changes the method or type of AA used when either [Override any application setting] or [Enhance the application setting] is selected in Antialiasing - Mode above. SMAA users will want to set this to [Application-controlled / Off]. Transparency antialiasing provides AA for transparent textures. This is for objects like fences, foliage, trees, and water. This setting is for multisampling. Enabling this in Skyrim has been known to cause textures which are not suppose to be transparent to display as transparent; including walls, door, and characters. If transparency AA is desired in Skyrim, use supersampling (below) since it's higher quality at about the same performance cost. Transparency antialiasing provides AA for transparent textures. This is for objects like fences, foliage, trees, and water. This setting is for supersampling instead of multisampling. Only use one or the other. If used, [2x Supersampling] is recommended as the minimum; however, adjust according to the performance/quality desired. Higher values come at more of a performance cost. Sparse Grid Supersampling is often better quality. In Skyrim, this setting can cause issues with the transparent textures of fires, walls, etc. This turns on or off Multi-Frame Sampled Anti-Aliasing (MFAA) and sets the quality of the setting. This is only available on Maxwell-based cards. MFAA is similar to TXAA, but is only implemented in a limited number of games by NVIDIA (27 at the time of this writing). The idea of MFAA is to offer good antialiasing that has less impact on performance, providing higher frame rates for smoother gameplay. 4xMFAA would, in theory, be around the same performance hit as 2x MSAA but offer close to 4xMSAA quality or a little better. This setting simple allows or disallows FXAA usage by the game. FXAA is a fast AA method. Although it works, it also softens the textures and hazes the scene so some texture sharpness is lost. Some users like this effect (Gopher being one of them); however, due to its effect on textures, it will add a bit of a "fantasy" feel to the overall game. FXAA should be set to [Disallow] for STEP, but can be used if desired. Leave as default. Setting to [On] will display an indicator on the screen telling the user if FXAA is enabled or not. This will force FXAA on or off. If FXAA is desired, it's recommended to use a FXAA injector instead. RCRN includes a very nice FXAA injector which is extremely light on performance. This section covers all the settings for texture processing. Anisotropic filtering is a texture filtering technique that improves clarity of textures when those textures are viewed at angles, such as when walking down a path or viewing water from the shore. For Skyrim, it is recommended to force AF through the drivers for the best results. When doing this, turn off anisotropic filtering via the Skyrim launcher or within the "SkyrimPrefs.ini". This controls the amount the textures are filtered. Use the highest setting possible, however for older or weaker systems a lower setting can be used for a very slight performance gain. Higher values, like the recommended setting, may cause texture shimmering in mid to long range texture LODs on some systems. If this happens, adjusting the LOD Bias (below) can help to remedy the issue. Notice:ENB/ENBoost users will have the option of using the ENBSeries AF instead. This is user preference, but only us one. ENBSeries AF can be controlled in the "enblocal.ini" file. This will override the profile used for anisotropic filtering. Runs optimized AF at the potential cost of image quality. This setting is only used if the "Texture Filtering - Quality" setting (below) is not set to High Quality. If enabled, it limits the number of samples that Anisotropic Filtering uses. This "optimized texture sampling" is suppose to have better performance, but it often results in slightly lower quality or produces shimmering in textures. Real world results are, most often, not noticeable for either performance nor quality. This will turn the driver's control of the LOD Bias on or off. If needing to adjust the LOD Bias (below), this setting will need to be set to [On]. Notice:"There are two settings for LOD Bias. "LOD Bias (DX)", which is for DirectX games, and "LOD Bias (OGL)", which is for OpenGL games. Use the LOD Bias which is for the game's use of DirectX or OpenGL (DirectX is most common). For Skyrim, this is DirectX. LOD Bias reduces the quality of textures as distance grows from the viewpoint to those textures. Setting this to a lower value will increase distant texture detail but will also come at a performance cost and lowering the value could also cause glitches such as texture shimmering. If a high anisotropic filtering setting is causing texture shimming (known as Z-fighting), then raising this value will make the distant textures more blurry and help to reduce the shimmering. It's best to leave it set to default if possible; [+0.0000]. This allows negative LOD Bias values which sharpen distant textures. If using anisotropic filtering, it is best to set this value to [Allow]. The [Clamp] setting is no longer supported by NVIDIA even though it still appears in Inspector. This controls the quality of the texture filtering. [High Quality] is best the quality, but with the highest performance impact. Likewise, [High Performance] is the best performance, but with the lowest image quality. For real-world use in Skyrim, the performance difference is about 1% even on weaker systems with little to no discernible difference. Other game's may vary. This setting is only adjustable if the "Texture Filtering - Quality" setting (above) is not set to [High Quality] and is only applicable to DirectX games. If enabled, this setting will substitute Trilinear filtering with Bilinear filtering where the software thinks trilinear is not necessary. This can result in lower quality filtering on textures. In real-world use for Skyrim, there is no discernible difference for quality or performance. It's is recommend to be set to [Off] for the best image quality or whenever AF is in use. This setting forces the driver-side AO on or off. Ambient occlusion (AO) is a lighting technique that determines when certain pixels are blocked from the environmental light by nearby geometry, in which case, its brightness value is reduced creating a shadowing effect. This provides much richer, more realistic shadowing in-game. However, AO is very performance heavy. Notice:If this minimum setting is found to be too heavy on performance, try turning it off and opting for SSAO provided by ENBSeries which can also be tweaked for performance vs quality. If both AO and SSAO are too heavy, the only solution left is to turn it off completely. This determines the drivers usage of Ambient Occlusion (AO). If Ambient Occlusion setting (above) is set to anything other than [Off], then this setting should be set to the default setting for the game profile being edited. If Ambient Occlusion setting is set to [Off] and another method of AO will be used instead (the the game's own built-in AO), then this setting should be set to [Enabled]. Else, if Ambient Occlusion isn't used at all due to the performance loss it come with, this setting should be set to [Disabled]. Notice:If Ambient Occlusion setting is set to [Off] and SSAO via ENBSeries will be used instead, then this setting should be set to [Enabled]. This setting is only for use with OpenGL games and can cause crashes in DirectX games. It is normally left at its default setting. This setting is not relevant to SLI systems nor to DirectX games. This is another setting only used for OpenGL game. The setting tells OpenGL games how to handle both mult-display monitors and multi GPU systems. If only one monitor is used for gaming, use the [Single display performance mode]. If multiple monitors are used for gaming, use the [Multi display performance mode]. If multiple monitors are used and some issues arise with the previous settings use the [Compatibility performance mode]. OpenGL games are not very common so this setting is not likely to be used. This setting has no impact for Skyrim. This should be left on it's default; [Adaptive], which ensures the graphics card changes its speed and power usage according to the load it's under. Users who have the newest GTX 10 series cards may see a new setting, [Optimal Power], which causes the GPU to not render any frames when nothing is changing on the screen. GTX 10 series users should use this new setting instead. [Per maximum performance] should only be used for troubleshooting purposes as it forces the GPU to run at maximum speeds. However, this can reduce stutter in some games to provide a smoothing gaming experience. Notice:Users should be aware in some situations when the [Per maximum performance] option is used, the GPU remains in its maximum power state even when the game is closed. Be cautions when using this option as it will decrease the life of the video card when left in this power state 24/7. Released with driver version 337.88, Shader Cache saves compiled shaders to a cache on your hard drive. This allows the shader to simply be recalled from the hard disk the next time it is required, potentially reducing load times and CPU usage. This setting turns the shader cache on or off. Setting this to [On] will show an indicator for PhysX. This setting controls the use of multithreaded optimization for games on systems with multiple cores and/or Hyper-threaded CPUs. By allowing the driver to offload certain GPU-related processing tasks as separate threads on available CPU cores, performance can potentially be improved. Some older games can have issues with this setting. If this is experienced users should set this to [Off] for those game profiles. Otherwise, it is recommended to leave this set to [Auto]. There's not much for troubleshooting currently. Troubleshooting will be added over time as issues arise in the forums. If textures are displayed as transparent which should not be transparent, this could be caused by Sparse Grid Supersampling or Transparency Multisampling. To fix this issue set Antialiasing - Transparency Multisampling to [Disabled]. Users can also switch Antialiasing - Transparency Supersampling to [Supersampling] instead of [Sparse Grid Supersampling]. Some NVIDIA cards (like the GTX 560 Ti) ceased rendering SSAO outdoors in Skyrim after the official 1.5.24 patch. The problem hasn’t been resolved, but NVIDIA is aware of it. For now, users can temporarily switch to Oblivion or Fallout 3 compatibility to get back SSAO in exteriors. This page was last modified on September 29, 2018, at 23:32.